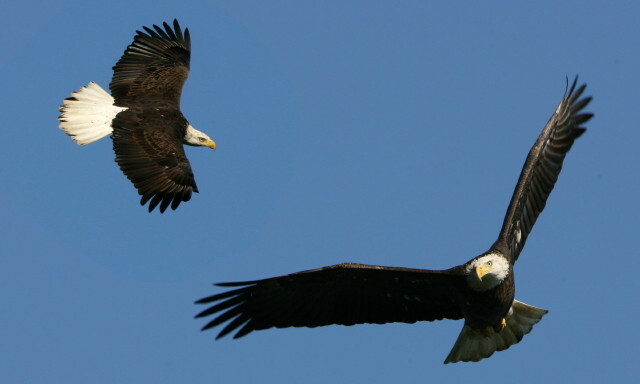 The Autumn Gathering Of Eagles along the Susquehanna River is upon us. Their numbers will steadily increase to a mid November peak. 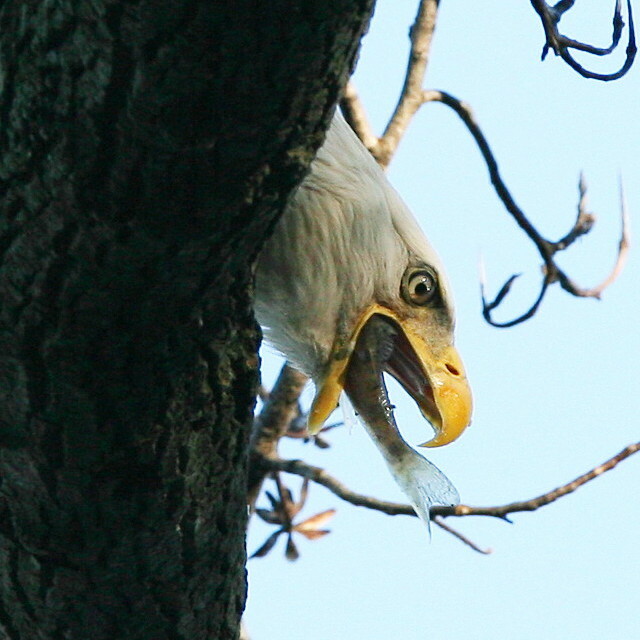 The Eagle-Osprey fishing rivalry has ended. 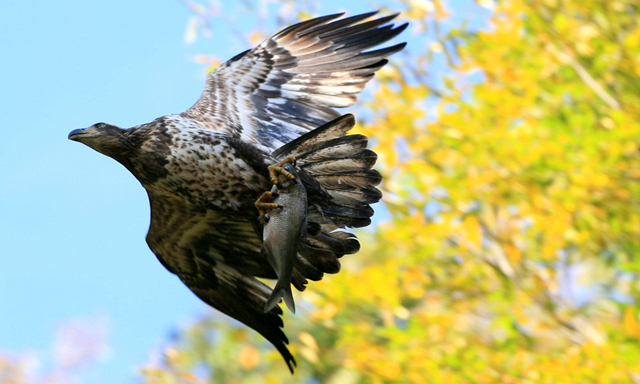 Ospreys are fishing machines and the eagles are glad to see them head south. Just a few weeks back, eagles attempting to fish were escorted back to the Harford County side of the river by the osprey. Lately there has been Eagle-Great Blue Heron fishing confrontations on the water. Photos will be posted as we head through this Autumn Gathering and migration. 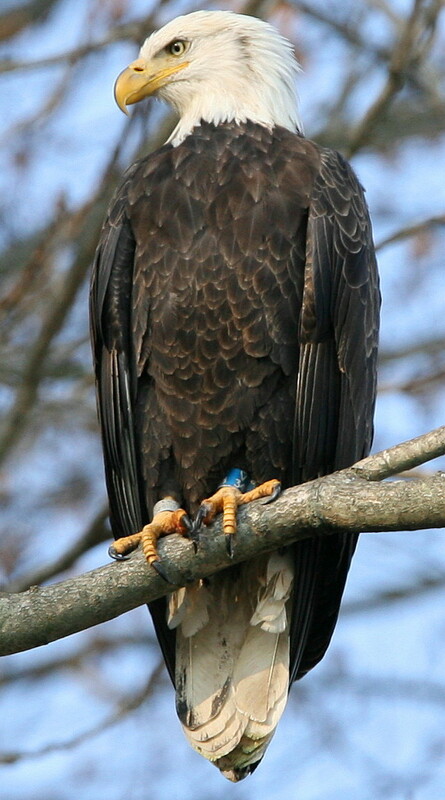 The Eagle-Great Blue confrontations are fun to watch. 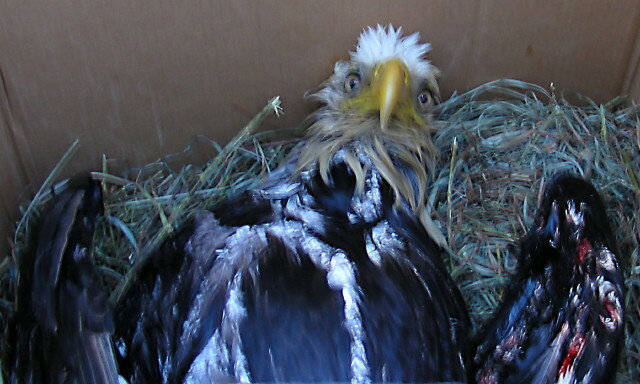 Eagle numbers on a good day through October 2, 2006 are around three dozen with most being juveniles. As of October 10, 2006 fish stealing is the name of the game along the river. Eagles take from eagles, eagles take from Great Blues, Great Blues take from Blues but only think about stealing from eagles. High drama on the river today, October 15, 2006. An adult eagle may have come in contact with a transmission wire causing it to crash into the river and break it's left wing. A life or death struggle took place as it was slowly forced down the river until it was grounded upon a shoal. Other eagles gathered. Was it for support? Are they related? Who knows? Our fighter just before transfer from DNR to Wildlife Rescue, Inc. Good Luck feathered friend. With the injury being too severe to repair, it's sad to say that our rescued eagle could not be saved. Her spirit was released to return to the river. Fishing gets tough when water runs swift. Eagle numbers thin out during high water and strong currents. Our friendly Great Blue appears to have been domesticated by the fishermen. Nest rebuilding at Red Oak was in full swing on October 26, 2006. After raising three eaglets this season Susque and HannaII appear to be in great shape. It was easy to count seventy five eagles on this last day of October. 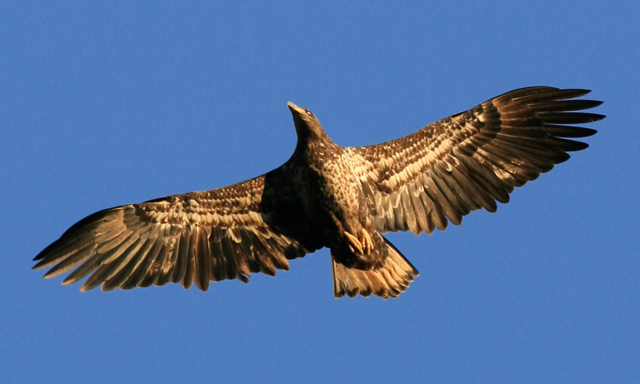 This young eagle appears to have a tracking device mounted on its back. I may try to track down the trackers. 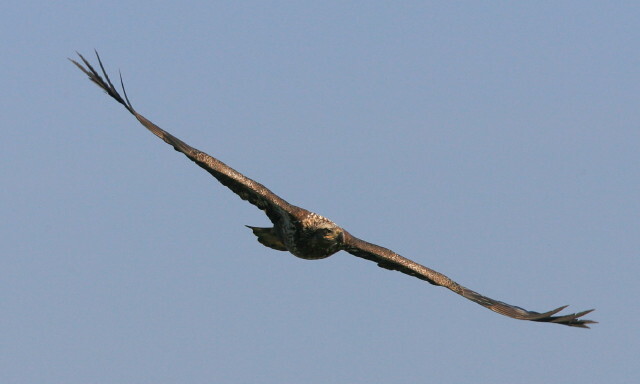 On November 10, 2006 a young Golden Eagle was photographed passing through the area. Andy got the photo...not me. I hope it sticks around. Golden photo not posted. November 15, 2006 was a "Catch and Release" kind of day. Many eagles caught fish but few got to eat them. Young eagles allow us to get spectacular close ups. In late November if you point your 600MM lens at the Cecil County side of the Susquehanna, your frame will contain at least a dozen eagles. This five year old (V34) has been photographed many times this month and is probably out of New York. The most photographed eagle of this fall migration. I will continue with this page until Winter Solstice. Eagles handle swimming quite well and this one got the fish. December 3,2006...one feather short of perfect. Susquehanna's December Centerfold, straight out of Sullivan County New York, this 3 1/2 year old female has the looks of a fifth year eagle and loves to be photographed. Move over Sweetie, V34 is here. December 12, 2006...Susque leaves nesting area after waiting for HannaII. As far as eagle photography is concerned, anything that is possible in Alaska is available here along the Susquehanna. As fall ends and eagle numbers begin to decline along the river I must say that this Autumn Gathering has been truly spectacular...again. 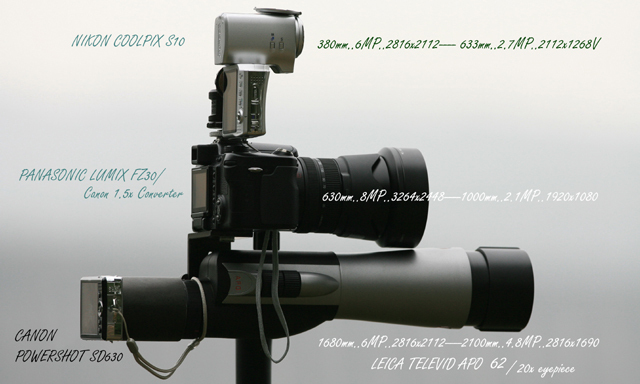 Many hundred plus eagle days, plenty of cooperating up close raptors, days with so many cameras and long lenses it looked Olympic and many new friends. I would have to visit many different locations in Alaska to experience the variety of eagle activity that is found along the Susquehanna below Conowingo Dam. Everything eagle in one spot....The Susquehanna.